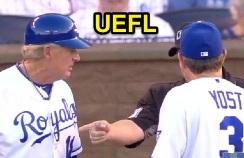 HP Umpire Todd Tichenor ejected Royals Hitting Coach Dale Sveum for arguing a runner's lane interference call in the bottom of the 1st inning of the Twins-Royals game. With none out and none on, Royals batter Paulo Orlando bunted a 1-0 fastball from Twins pitcher Tyler Duffey to catcher Kurt Suzuki, who threw to first baseman Trevor Plouffe as Orlando arrived at first base. Replays indicate Orlando ran inside (to the left of) the lane line and thus failed to remain within the runner's lane, but that Orlando's actions in running inside the line did not interfere with Plouffe because Suzuki's throw was of poor quality and likely could not have reasonably retired the runner (the throw was to the right/foul territory side of first base), the call was incorrect. * Ruling was challenged and affirmed by the UEFL Appeals Board (7-0-1), the call was incorrect. At the time of the ejection, the Twins were leading, 1-0. The Royals ultimately won the contest, 8-1. This is Todd Tichenor (13)'s third ejection of the 2016 MLB regular season. Todd Tichenor now has 4 points in the UEFL Standings (6 Previous + 2 MLB - 4 Incorrect Call = 4). Crew Chief Bill Miller now has 3 points in Crew Division (3 Previous + 0 Incorrect Call = 3). *RLI Terms: Inside = To the left/in fair territory; Outside = To the right/foul; Within = Between the lane lines. This is the 140th ejection report of the 2016 regular season. This is Minnesota's 6th ejection, T-2nd in the AL Central (CWS 7; DET, MIN 6; CLE, KC 5). This is Dale Sveum's 2nd ejection of 2016, 1st since June 10 (Chris Guccione; QOC = Y [Check Swing]). This is Todd Tichenor's first ejection since April 27, 2016 (Don Mattingly; QOC = Y [Balls/Strikes]). Wrap: Minnesota Twins vs. Kansas City Royals, 8/18/16 | Video available via "Read more"